A consumer tech giant made the biggest acquisition in its history, and a popular discount airline paid the price for not discounting the way it said it was. Here's a rundown of the week's best and worst in the business world. The "bags fly free" airline loves to jab at its competitors for slapping extra fees on everything from luggage to legroom to hide their true total fares, but Southwest's advertised rates sometimes lack integrity too. Southwest messed up late last year when it promoted $59 fares for certain popular routes that it never ultimately offered at that price. The unfortunate episode came to a head this week when Southwest was fined $200,000 for deceptive marketing. 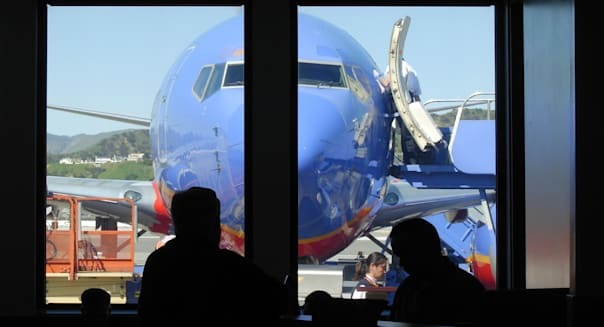 It was a rare misstep for Southwest, and now it's paying the price in more ways than one. After weeks of speculation, Apple finally announced that it would pay $3 billion for Beats Electronics and Beats Music. Some have questioned the deal. Is Apple paying too much for what will be the largest acquisition -- by far -- in its history? Is the consumer tech giant desperate? Is this the end of organic innovation at Apple? %VIRTUAL-article-sponsoredlinks%Settle down. This purchase is a brilliant move. Beats Electronics is the leading marketer of premium headphones, and this gives Apple a high-end accessory category that it hasn't excelled at on its own. It also gives Apple a neat way to play the popularity of rival platforms since headphones, naturally, are operating system agnostic. Beats Music also gives Apple a foothold in the booming on-demand streaming category. It may have just 250,000 paying subscribers, but this is a market where Apple had struggled to obtain music label licenses. Apple only had the discovery-based iTunes Radio where listeners can't stream the exact song or playlist they crave. Beats Music solves that dilemma. There's a surprising service missing from Western Digital's new set-top media player. WD TV has plenty of slick features and it plays all of the popular file formats, but it somehow doesn't support Netflix (NFLX) streaming. Fans of WD TV will argue that not everybody uses Netflix or Vimeo, but the same can be said about all of the less popular services that it does support. Netflix has 48.4 million subscribers worldwide. Even Netflix's 12.7 million members outside of the U.S. are a large enough audience to justify addresses this lapse. If the WD TV wants to be the set-top device to replace all set-top media players, it needs to offer access to the more popular streaming platforms. More than half of the satellite radio receivers in cars are inactive, so Sirius XM Radio is waking up all of those idle receivers to offer 60 channels of its talk and commercial-free music stations through June 2. It's a smart move since the hardware is already in place and it doesn't cost much to activate those tens of millions of dormant receivers. It ran a similar promotional stunt four months ago, and it has offered shorter free previews often in previous years. If even a tiny fraction of those enjoying the preview decide to stick around as paying customers, it will be a successful business move. You won't often see the leading warehouse club operator on the wrong side of the market. Costco is a investment and political darling that's praised by those on the right for its lean operations and business-pumping expansion and praised by those on the left for its high wages and employee satisfaction scores. Unfortunately, something's starting to go wrong on the way to the bottom line. Costco reported a reasonable 7 percent increase in sales in its latest quarter, but earnings climbed just 3 percent. More importantly, this is the fourth quarter in a row that the provider of savings in bulk has come up short against analyst profit targets. Sales and comparable-store sales may be holding up just fine, but Costco is beginning to struggle where it has excelled in the past. Motley Fool contributor Rick Munarriz owns shares of Netflix. The Motley Fool recommends Apple, Costco Wholesale and Netflix. The Motley Fool owns shares of Apple, Costco Wholesale, Netflix, Sirius XM Radio and Western Digital. Try any of our newsletter services free for 30 days. You may think you're being frugal by trying to get every last month of use out of that fridge from the 1980s, but you could actually be costing yourself money. Old appliances don't run as efficiently as newer, Energy Star-rated ones, and that adds a lot to your electric bill. Invest in newer models, and they will pay for themselves soon enough. Potential savings: $50 to $100 per year, per appliance (depending on the respective efficiency of your old/new ones). Remember how your father used to annoy you by insisting you turn off every light in rooms you weren't in? He was onto something. The cost of leaving modern appliances running when you're not using them can add up, so stop leaving the TV on "in the background" or letting your computer hover in "sleep mode" overnight. If you're not using something, turn it off. Potential savings: $20 to $50 a year. Water waste is a huge problem in many homes. Be mindful of how much you're using, and adjust your routines. Try taking shorter showers, only running the laundry and dishwasher when you have full loads, running your sprinklers only when needed, and not leaving the water running when you brush your teeth. Potential savings: A few bucks to $50 or more a month, depending on your local sewer and water rates. It can be all too easy to "set it and forget it" when it comes to heating and cooling costs. Invest in a programmable thermostat that will automatically adjust the temperature based on the times you're actually at home. Close the vents in any rooms you're not using. If you have window air conditioning units, make sure they have an "energy saver" function so they only run when needed instead of constantly. Potential savings: $20 to $50 per month, depending on local costs and climate. If you're big on convenience, you could be paying more to keep your house clean than you need to. For an easy switch that won't add much more time to your cleaning routine, consider switching your paper towels for reusable sponges and your disposable dusting wipes for rags and a cleaning spray. Potential savings: $5 to $10 per month. That toilet that keeps running may seem like a minor annoyance, but small problems left unattended to can result in big problems down the line. The instant you notice something's starting to malfunction, address it. You don't want that tiny leak in your laundry room sink to turn into a flooded basement that will cost you thousands. Potential savings: Could reach $10,000 or more if you're using that flooded basement as an example -- although that depends on what part of the bill, if any, your homeowner's insurance will cover. Avoid expensive repairs as much as possible by keeping things in good running order year-round. Regularly clean out the vents under your fridge and in any air conditioning units. Change the lint traps in your dryer and vacuum cleaner often. Get the blades in your lawnmower sharpened each season and make sure to change the oil as needed. Have your heating ducts cleaned out annually. A little preventive maintenance can save you costly fixes and make appliances last longer. Potential savings: $100 to $300 per year, if you can squeeze several additional years of life out of multiple appliances such as your washing machine, clothes dryer, vacuum cleaner or air conditioner. If you pay your utility bills each month without question, you could be paying more than you need to. You'd be surprised to find how many companies are willing to negotiate on rates. Get on the phone with customer service and see what options are available. You never know unless you ask. Potential savings: $5 to $40 per month. You're wasting more than space by holding onto those boxes of baseball cards in your attic and that shelf of old electronics you keep saying you're going to repair (but you know you never will). Save yourself cleaning time and make a little extra money by getting rid of anything you're not actively using. Garage sales, Craigslist and eBay are all great ways to turn your unwanted junk into profit. Potential profit: $5 to $500 or more, depending on how valuable your possessions are. If you recently became an empty-nester (or you bought too big a home to begin with), you could be paying for rooms you never even use. Downsizing will save on rent or mortgage payments, and it can also reduce your monthly utility costs. Potential savings: Tens of thousands of dollars, depending on the cost of your current home, as compared with the home that you downsize into.